A Nest Amid Thorns: Happy Thanksgiving!! Just a quick post to wish everyone a wonderful Thanksgiving day. This afternoon it was a bit dreary out and rainy. I would never have thought to go outside to photograph anything, but, as I was typing on my computer I glanced out my window and saw.......a hummingbird darting near my Cape Honeysuckle bush. 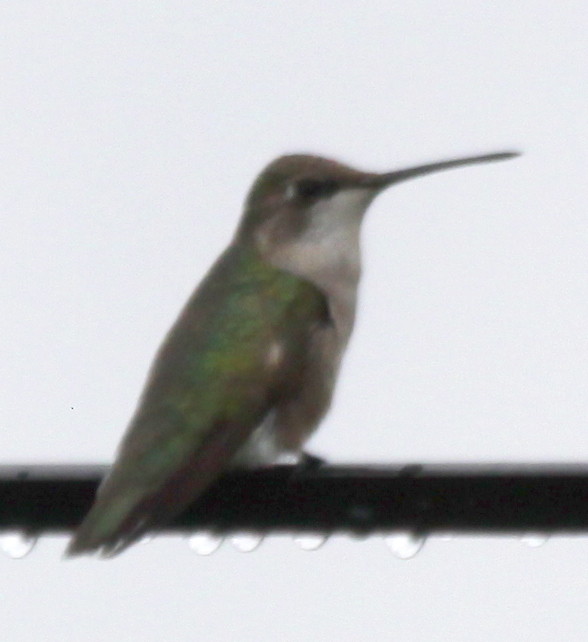 I think it was a female Ruby Throated, since she had no ruby throat. That's about the only kind of hummingbird you see in South Florida in the winter (they are migrants here) - that I know of. She - or her kin - has been here before. Last year, to be exact. There was a tiny female Ruby Throated last spring who was so tired she was resting with her eyes closed on a branch in our yard. Even though she was resting, she rocked side to side a little bit, kind of like a child with ADD who can never sit still. We have lots of bushes that hummingbirds like. The Spot Breasted Oriole loves the same things. While he chews the whole flower to get the nectar, the hummingbird pokes her long beak into the center of the flower to sip. I'm going to have to keep a sharp eye out because I know there are lots more critters out there than I ever see. For instance, after I came back into the house, I happened to glance out the same window again - and I noticed a "flower" on the bougainvillea that didn't match the colors of the other flowers on the same bush. 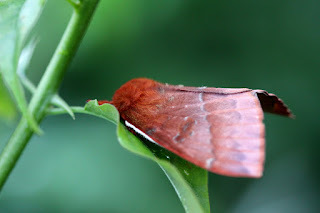 I got a closer look and knew it was an unusual and beautiful moth. Back out I went to photograph. I'd like to say I got a good photograph of the hummingbird, but I did not. I can prove she was here, but the photo is from way too far away and is blurry as well as shot against a too bright background. But I've got time and patience and I'll be looking for her every day now that I know she's here. The photos of the moth came out MUCH better. Here they are. Remember to click on each to "embiggen" them. Yup - you can tell it's a hummingbird, but that's about it. I'll be watching for her and for better photos!! A beautiful Io moth. 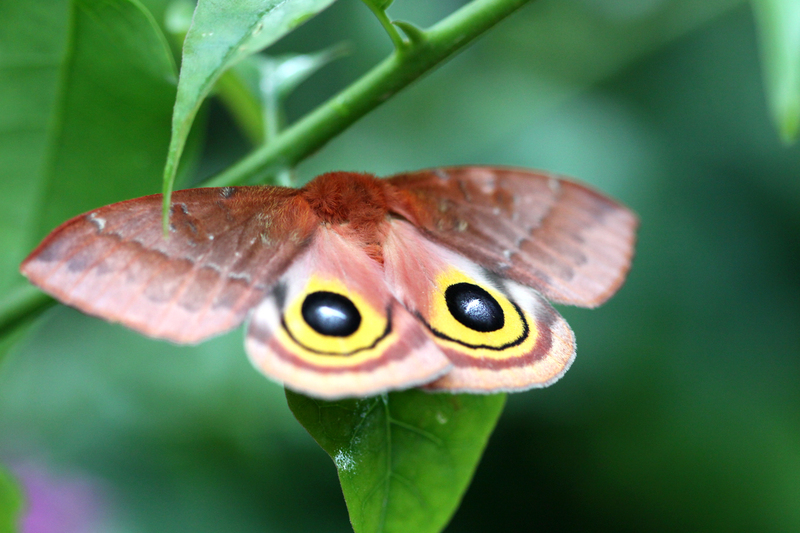 Above - wings closed. 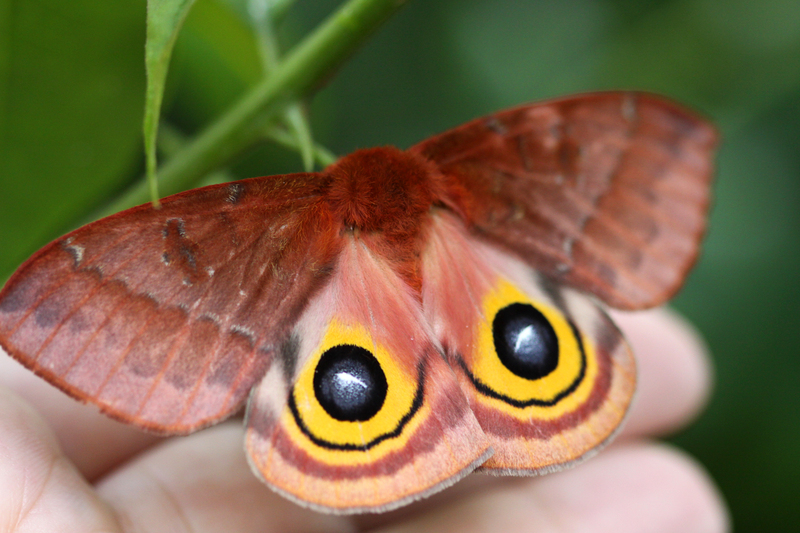 I touched her/him - and he opened his wings so I could see his "eyes", meant to scare off predators. After that I left him alone, not wanting him to feel in danger here. How beautiful!!! I love the fuzziness of the head area.